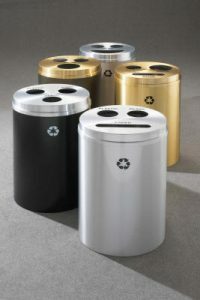 RECYCLEPRO 3 provides 20” diameter receptacles designed to collect three types of recyclables or two types of recyclables plus waste in a single receptacle. Five different openings are available in five possible combinations to allow your facility to easily implement an instant recycling program with minimal space and cost. Each opening on this triple stream recycling receptacle has a separate plastic liner can provided, as indicated on the product information chart. This “smart RecyclePro” product has a high efficiency factor which means that receptacles can be serviced less frequently, saving time and money. More than one RecyclePro 3 unit may be used together or along side of single and/or dual purpose RecyclePro 2 units. Yes, they are all part of the same family and can be mixed and matched to your individual taste!